The following article was published on rfidjournal.com on May 18, 2015. South Metro Fire Rescue Authority is tracking medical supplies at its warehouse and at 17 stations, to reduce waste and improve efficiencies. South Metro Fire Rescue Authority, in Centennial, Colo., provides emergency and prevention services for roughly 195,000 residents in two counties, as well as for the thousands of people who come into the communities to work. The organization’s Fire & Emergency Medical Services (EMS) department operates from 17 stations and is staffed by fire and emergency medical technicians (EMTs) and paramedics. It’s essential that their ambulances are equipped with all the medical supplies that might be needed in an emergency situation. South Metro faced a few inventory management challenges. The organization was maintaining an excessive amount of inventory. The warehouse at its headquarters and each station were stocked with the same number of medical supplies. In addition, the majority of the medications and other medical disposable supplies have expiration dates. Often, the medical supplies expired before they could be used, due either to overstocks or to a lack of demand for those products. That includes the rarely used supplies and pharmacology the organization’s Advanced Life Support units are required to carry for critical intervention. South Metro Fire Rescue Authority tracks medical supplies at its warehouse and at 17 stations via an RFID solution from Silent Partner Technologies. South Metro was using a highly labor-intensive process to update its inventory, Buchanan says. This involved having crews at each station manually count and verify expiration dates for all supplies, which took a long time and was prone to human error. The organization needed an efficient way to monitor medical supplies so they would likely be used before the expiration dates were reached. In March 2015, South Metro adopted an RFID inventory management system known as IntelliView, from Silent Partner Technologies (SPT), to improve efficiencies. Following a pilot at South Metro’s warehouse to demonstrate the solution for the entire management team, the organization decided to roll out the solution at all 17 stations. The system is helping South Metro to better manage inventory, reduce waste from expired products and improve asset control, Buchanan says. 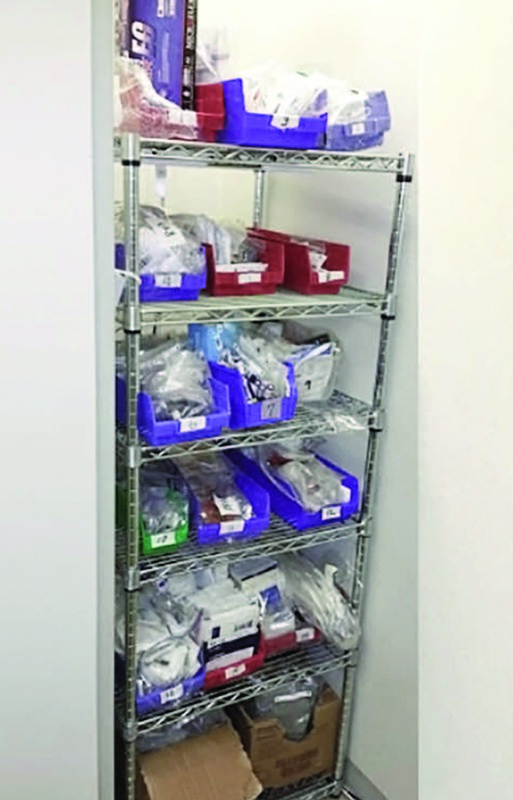 The project committee, which includes representatives from EMS, IT and logistics, conducted a one-time assessment of the medical disposable inventory at the 17 stations. The team calculated that, at the time, it was approximately $178,000, one-third of which was being lost to medication expiration. South Metro had used bar codes to track some supplies, but it wanted to deploy a technology that could control inventory and improve logistics processes. Bar code systems could not support this, Buchanan says. The committee determined that an RFID system seemed best suited for its needs. After evaluating a number of vendors and systems, South Metro selected SPT’s IntelliView solution, an asset and inventory management solution designed for fire and EMS organizations. IntelliView uses active and passive RFID technology to track both serialized items (such as narcotics) and non-serialized assets and supplies (maintenance equipment and portable computers, for instance) at the stations and in the field. IntelliView’s UHF RFID solution turns a rack that holds supplies into a smart shelf than can identify tagged items. The main feature of IntelliView’s solution is IntelliShelf, which uses passive ultra high frequency (UHF) RFID technology to turn a rack that holds supplies into a smart shelf that can identify tagged items. A rack is retrofitted with antennas and a Mercury 6 fixed reader from ThingMagic, a division of Trimble. be placed on the item without covering up drug information on the bottle’s label. SPT’s IntelliView cloud-based software includes middleware to manage tag reads and an inventory management application. When a tagged item is removed from a smart shelf, it is automatically detected and inventory is updated in real time. The software also can track when products will expire and features a scheduling calendar for monitoring when items need to be recalibrated. All supplies are RFID-tagged at South Metro’s headquarters. At nine of Metro South’s 17 stations, racks were outfitted with the IntellShelf technology. Racks at the remaining eight stations have not yet been converted into smart shelves. At these stations, logistics staff members take inventory with CS101 handheld RFID readers from Convergence Systems Ltd. 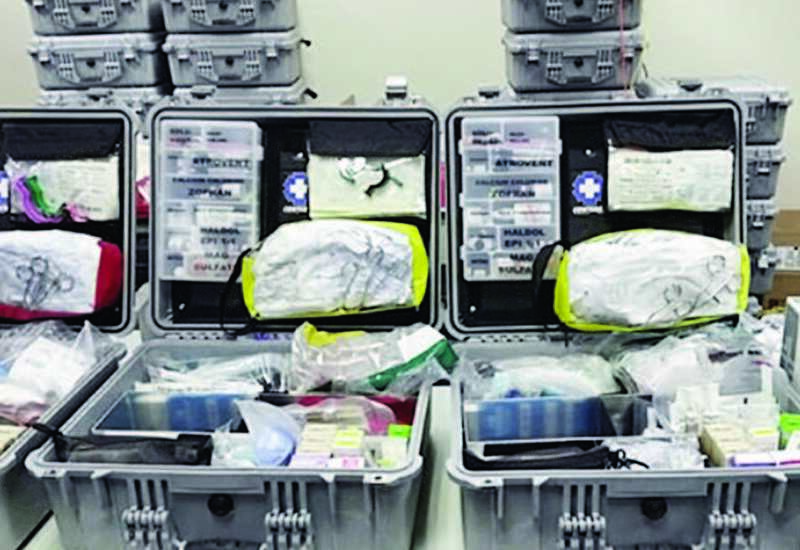 The active RFID system tracks plastic Pelican cases holding critical-care supplies for ambulances. In addition, at the warehouse and each station, assets — such as defibrillators and other medical equipment and rugged notebook computers — are identified via active tags from Wavetrend (modified Micro tags and Indoor Asset tags). They are tracked using a fixed Wavetrend (modified RX50) reader. Logistics personnel can view each unique asset’s location via the Web using SPT software. South Metro also uses active RFID technology at the stations to track Pelican cases, plastic transport containers that hold critical-care supplies for ambulances. Each case is identified with an active (modified) Micro tag from Wavetrend. The tag, used in conjunction with a fixed Wavetrend reader, can identify whether a case has been opened and needs to be replenished with supplies before being put back in service. When a case is brought back into a station from an ambulance, the reader detects whether the Pelican case has been opened. The way this is done is that any time the case is opened, the number in the tag changes. The next time that tag is read at a station, South Metro logistics personnel are alerted that the case has been opened, so they know it needs to be checked for replenishment and then “re-authenticated” for use in another ambulance. The biggest challenge of the implementation was figuring out the appropriate tag for all of the different supplies, Buchanan says. “Some of the supplies are fluid-based [such as medications] and others are in protective metal containers, making the tags difficult to read.” SPT and South Metro addressed this by developing a specific process for how and where items are tagged, as well as how they are stacked in their bins. South Metro estimates it will achieve a return on investment from the system within 18 months, Buchanan says. Before the RFID deployment, South Metro’s total inventory — including supplies at the warehouse and 17 stations — at any given time was more than 20,000 items. Thanks to the RFID solution, the organization has been able to cut that amount in half. South Metro’s headquarters now serves as a central inventory facility for all supplies, which are delivered to each station weekly based on need. The RFID solution provides visibility into what each station needs to have replenished, Buchanan says. It now takes roughly two and a half hours to replenish a battalion — five to six stations — a process that used to take a minimum of six hours. The solution automatically generates Pick Tickets, so logistics personnel know which items each station needs. In the past, each station had approximately 1,500 to 2,000 items, and it took a logistics person a day or two to count them. Currently, inventory at each station has been reduced to an average of 580 items. The smart shelf provides continuous real-time inventory data. At the stations that haven’t been equipped with smart shelves, it takes one person with a handheld reader 15 to 20 seconds to inventory a rack. All told, South Metro expects the RFID solution to contribute to an estimated 400 percent reduction in labor cost. In addition, South Metro can now see exactly which products are about to expire and when. That enables it to move time-sensitive items to stations where they will likely be used before the expiry date. South Metro expects a 30 percent reduction in waste from expired items. South Metro would like to equip the remaining eight stations with smart shelves during the next year or so as its budget allows, Buchanan says. After that, he says, when funds become available, South Metro will consider adopting SPT’s IntelliVan solution, which shows EMTs if a vehicle is fully stocked with key assets and ready to go. An ambulance driver, for example, could know before he or she leaves for an accident scene or returns to a station whether a defibrillator is still in the vehicle or if a particular drug is running low.